Spencer the Adventurer had his first head bleeder yesterday! One of those little things that happens so fast. He was brushing past my leg one second and the very next second there was a bang and roar. And it wasn’t even the usual chaos of three. I had seven kids with me. Seven. Two of whom had been dropped off for a playdate and two more neighbours. It was later when I got home from the doctors that I found out what actually happened him. He tripped over something and went forehead first into the corner of a coffee table. Ugh, I feel queasy again when I think of the first look I got at that gash and the blood running down his face. It’s such a crazy few minutes when your little one has had a bang. The worry for me is always what’s going on under that bump? Is there anything wrong that I can’t see? A friend was at our house doing some garden work so I called on him to watch the other kids untill I ran and got a neighbour to come sit with them all and I headed off to the doctor. Actually, I didn’t even know where I was going when I drove out. The family doctor was already closed, do I need to get him to hospital, do I chose the hospital that’s not too far or the one that’s further but is a specialist children’s hospital? If I waste time getting to a doctor and he passes out or something am I going to regret not going straight to A&E? 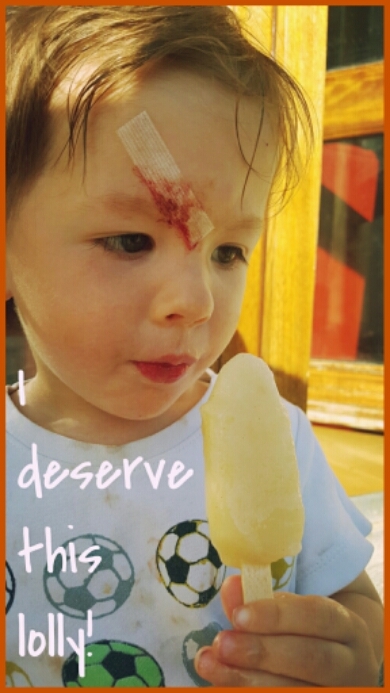 While I’m having all this internal panicked conflict, Mr. Spencer is in his seat devouring an ice lolly and telling me about his ‘poor sore head’! I can see he’s fine really. Doesn’t fully calm me but anyhow, I mosey on and find the local doc on duty and he starts by giving me a hard stare and slowly says “you calm down now”. Brave Spence had his cut glued and covered with a steristrip and our time at the surgery was over in minutes. I wonder will he be telling the story of his cool scar to his friends in school in a few years time? I wonder will he make up a much more impressive, elaborate story with shark attacks or wrestling with lions? Spencer the Adventurer. Scar #1.